Entrance tickets are not included in the tour fee and the ticket costs will be owed to the tour guide before the tour begins. We save you time by buying entrance tickets in advance so you can skip the lines. This service is provided at no extra cost. Note that children under 18 years old have free admission to the Acropolis and all the archaeological sites. Athens is a city of ancient and modern layers, a place of fascinating ancient ruins that stand alongside a bustling metropolis. With your local guides, you’ll explore the key landmarks, historic sights, unique neighborhoods and take in astounding views of the city that sprawls out to the coast. A highlight of the tour is the Acropolis, the eternal landmark of Athens and a destination of incredible architectural, historical and cultural significance. Set on a high rocky outcrop at the core of the Greek capital, monuments such as the Parthenon tell a story of a great era that shaped the Western world as we know it. Start at the Syntagma metro station for a 10-minute tour inside of the station’s museum. Archaeological artifacts uncovered during the metro’s construction offer insight into daily life here thousands of years ago. 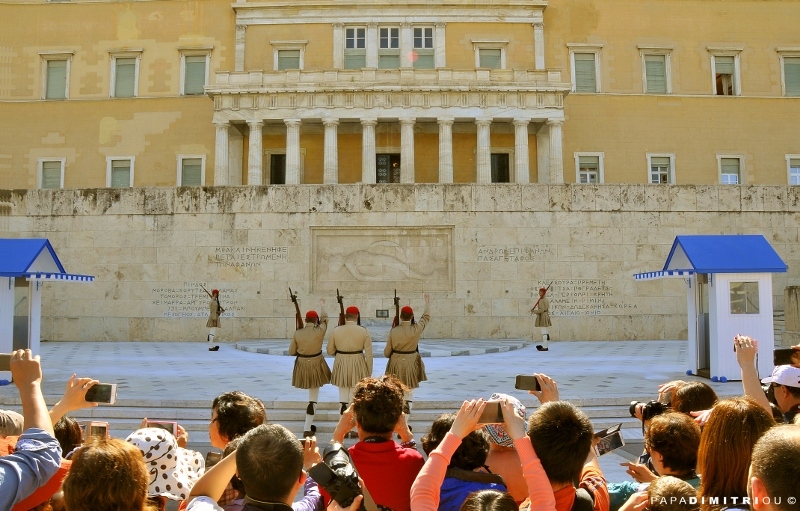 The next stop is the Greek Parliament, followed by the Monument to the Unknown Soldier where you will watch the Changing of the Guards. The walk continues to the National Gardens of Athens, Zappeion, Temple of Zeus and Hadrian’s Arch. The route passes through the charming and historic Plaka district to the next stop: the Acropolis. During your tour, you’ll gain insight into the significance of its historic monuments including the Parthenon, the Erechtheion, the Propylaia, the Nike Temple and other significant sights including the Odeon of Herodes Atticus, the Ancient Agora, the National Observatory of Athens and the city’s scenic hills: Filoppapos, Mars, Pnyx, the Odeon of Herodes Atticus and the Ancient Agora. After the guided portion of the tour, you will have the opportunity to explore one of the oldest neighborhoods in the world: Plaka and Anafiotika area, which is located on a hill above the Plaka district. You will have free time to take in the atmosphere in this unique urban pocket of culture and charm which oozes with atmosphere. Here, you can stop at simple, traditional or trendy outdoor cafes, shop at mom-and-pop boutiques selling local goods and souvenirs or try a local dish at traditional eateries. Plaka is a district where diverse architectures merge and the perfect place to snap the most memorable of photos as you stroll down the narrow stone pedestrian walkways and wander cobbled paths shaded by colourful bougainvillea. Admire the white washed cubic houses, with bright painted shutters and beautifully carved wooden doors, elements of a typical Cycladic architecture! An Athens Walking Tour representative will be waiting for you at a designated area outside of the customs building. Look for someone holding an orange colored Athens Walking Tours sign. Your transfer will depart from the port at 8:45 am. Your driver will drop you off at the entrance of the Syntagma metro station in front of the Parliament building. Head inside of the metro station’s lower level to find your Athens Walking Tours guide who will be holding an orange colored Athens Walking Tours sign by the ticket validating machines underneath the hanging clock. The tour starts at 9:30 am. Your transfer will depart at 15:50 (3:50 pm) from Patseas Jewelry Store, at the beginning of the pedestrian Dionysiou Areopagitou walkway and across Hadrian’s Arch. The guide will point out this meeting place earlier during the tour. The vehicle will have an orange colored Athens Walking Tours sign in the window. If for any reason you miss the return transfer, you will have to return to the Port of Piraeus by your own means.